of a spell gone wrong, a love potion gone right, deceit, revenge, black magic and redemption." For the very first time I based my characters on real people: Amy is modelled on the German singer Annett Louisan, and Fox on the young Eric Stoltz. Hobbes, Fox's valet, is named after the cuddly tiger from the Calvin & Hobbes comic books. The Horrible Histories of Mayence. The quotations from The Horrible Histories are all taken from a 19th-century edition of Richard Johnson's The Seven Champions of Christendom, one of the books I studied for my PhD thesis. After a magical mishap that turned her uncle’s house blue, Miss Amelia Bourne was stripped of her powers and sent to London in order to be introduced into polite society—and to find a suitable husband. Handsome, rakish Sebastian “Fox” Stapleton was all that and more. He was her true love. Wasn’t he? ... or the bitter taste of deceit? At Rawdon Park, the country estate of the Stapletons, Amy began to wonder. Several inexplicable events suggested that one sip of bitter punch had changed her life forever—that this love, this lust, was nothing but an illusion. She and Fox were pawns in some mysterious game, and black magic had followed them out of Town. Without her powers, would she be strong enough to battle those dark forces and win? And would she be able to claim her heart’s true desire? Magic potion or no, what she felt for Fox was a spell that could never be broken. "Enchantment and romance abound in Schwab's captivating tale of a spell gone wrong, a love potion gone right, deceit, revenge, black magic and redemption. Her romance captures the aura of the Regency and the essence of a paranormal, which should make it a surefire hit with fans." "Sandra Schwab can always be relied upon to deliver a spectacularly original read that is liberally sprinkled with plenty of fun, ingenuity, freshness and charm and Bewitched is certainly no exception! 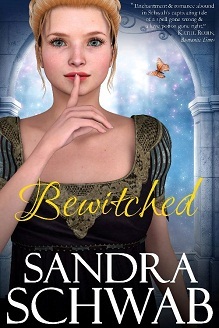 An enchanting tale featuring a lovely heroine, a gorgeous hero, lots of drama and plenty of gripping twists and turns to keep the readers turning the pages, Bewitched is a magical tale that will certainly brighten up anybody’s day." "I know a love potion in a romance story is not new ground, but when Sandra Schwab gets hold of a worn-out plot like that, she breathes new life into it. This author never disappoints me. Her books are always innovative and, of course, romantic, and her characters are alive and real. Bewitched is no exception. [...] Once again Ms Schwab has given us a romance filled with joy and strife, characters you fall for right away and root for when things go awry, and a storyline with writing so different from anyone else. It’s the little extras in her books that make you keep turning page after page." "Bewitched is a funny, adventurous paranormal romance. Sandra Schwab has definitely done her research before she ever started on this story, and it shows. With her descriptions of the balls and clothes and events during the 'season' in London to the foggy Fenlands, Sandra Schwab vividly transported me to each and every place." "This is the second book by Ms Schwab that I’ve had the pleasure of reading. It most definitely won’t be the last. [...] Amy is such a wonderful character. She is strong even when she fears her own weakness, and lets her generous heart guide her during moments of darkness and uncertainty. For his part, Sebastian’s reactions and feelings are so well drawn, so deeply felt, that my heart ached for both of them." "In Bewitched, Sandra Schwab captures love’s first dreamy moments in all its splendor." "Sandra Schwab, author of The Lily Brand and Castle of the Wolf, gives us in Bewitched a paranormal romance that is rife with drama and intrigue. What happens when a young woman and handsome man take a love potion? A romance inevitably ensues, and in this case, with it come negative consequences that neither party can foresee. It begins with Amelia, a young debutante who is introduced into polite society, and as the story unfolds it's sprinkled with lively dialogue and characterization, often humorous and entertaining." A lazy breeze stirred the late-summer air and played with the leaves of the trees along the canal that bisected the meadows and fields. It tussled the mane of the horse trailing the heavy barge filled with Black Country coal and tickled the cheek of the boatman. The breeze blew on, over sheep-dotted green, over the ruins of a castle which had once belonged to a favorite of the Virgin Queen, over an old battlefield where Roundheads and Cavaliers had met long ago; on and on it blew until it whistled around the pointy spire of a small parish church. From there it followed the slow rise of the hills and teased the branches of a grove of elm trees in the valley beyond. Here the air was filled with the chirping of birds and the humming of wild bees. The grove opened into lawns of lush green and flowerbeds blazing with color. Amidst the gardens nestled a small, stout manor house in the honeyed tones of the local sandstone. Bulky chimneys stretched heavenwards, emitted a tickle of smoke. Nearby, a lark rose jubilantly into the clear blue sky, and the breeze ruffled its feathers. One of the chimneys twitched. The breeze died away. The birds fell silent. Even the hum of the insects stopped. A shudder runs through the chimney. A sliver of cobalt blue appears at its top. It stretches, widens, forks like lightening, sparks more spots of blue. They span the roof, run down the gables -- one has reached a window in the upper storey. The backdoor slams open, Cook comes running out, and her kitchenmaids, shortly followed by the housekeeper, the upstairs maids, the footmen and the butler. He draws a handkerchief from his pocket and dabs his forehead while he watches the blue spread. Inexorably, cobalt covers the house. Another door is flung open. Boots clatter on the front steps as a horde of boys and young men rushes out into the forecourt. The sunlight glints on their curly black hair as they crane their necks to look in dismay at the increasingly blue walls. "Uh-oh," the youngest said and put his thumb into his mouth. "Darn it," the eldest swore and rubbed his neck. A petite young woman was the last to leave the house. Her golden brows puckered, her rosebud mouth pursed, she stomped down the stairs. A smudge of dirt clung to one rounded cheek, and under her arm she carried an enormous leatherbound tome. "How bad is it?" she asked, without turning around. Wordless, her black-haired cousins stared back at her. She sniffed. "That bad?" She risked a look over her shoulder. Her eyes widened, and she swung fully around. "Blast it all! How the blazes did that happen?" "Well. It could've been worse, you know," one of the boys offered. "Just think that would've happened if Mother hadn't gone to visit Lady Grisham today!" "Or if Father weren't out on his daily ride just now." "Indeed, with some luck it'll have vanished until he returns home." They all eyed the house. Blue ran down the walls like icing from the top of a cake. They took a step back. "What? What is it? Why doesn't it stop?" The young woman started to leave hectically through the book she was carrying. "That's not what was supposed to happen!" "Uh-oh," her youngest cousin mumbled around the thumb in his mouth and pointed towards the grove. A lone rider had appeared between the elm trees. Just then he caught sight of the blue house: abruptly, he reined in his horse, stared -- and fell out of the saddle. The young woman visibly paled. "Oh blast, I'm in so much trouble," she whispered. The walls shivered. The glass in the windows rattled as the house raised itself from its fundaments and, swaying gently back and fro, came to stand on two giant chicken legs.